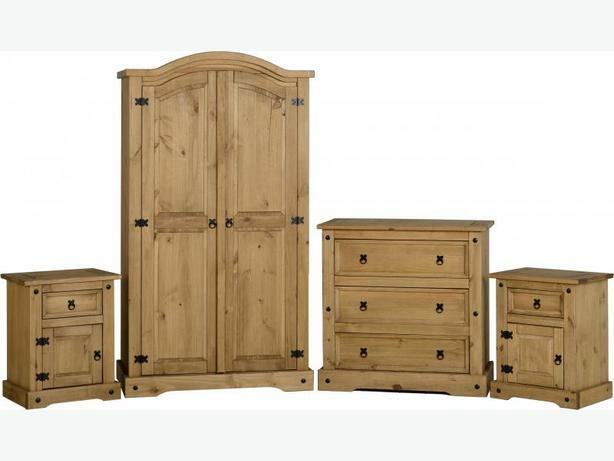 CORONA 4 PIECE BEDROOM SET CONSISTING OF 2 DOOR WARDROBE 2+2DRAWER CHEST AND 2 X BEDSIDE LOCKERS FOR A SHORT PERIOD OF TIME ONLY £299.00. THE RANGE IS IN SOLID PINE FINISHED IN A WAXED PINE FINISH. THE WARDROBE IS 104CM WIDE WITH A DEPTH OF 57CM AND A HEIGHT OF 189CM, THE 2+2DRAWER CHEST IS 92CM X 49CM WITH A HEIGHT OF 105CM AND THE BEDSIDE LOCKER IS 53CM X 39CM WITH A HEIGHT OF 67CM.